The boys giving it their all in the trials for the 110 meter high hurdles. 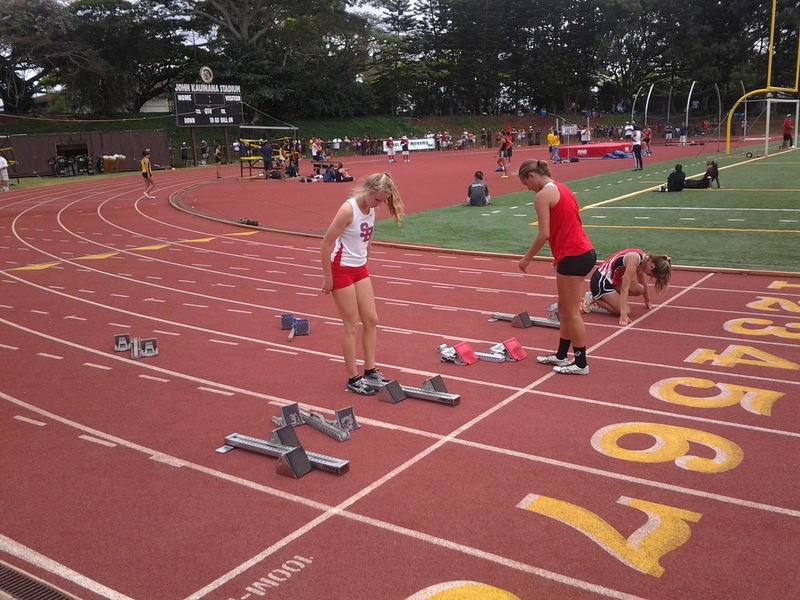 This track season I volunteer coached for the high school boys and girls at Seabury Hall. Seven girls, and four boys qualified for the state championship meet. We traveled over to Oahu early Friday morning anticipating the trials later on that afternoon. After trials five girls remained, and one boy representing the Seabury Hall Spartans. Before the last event on Saturdays finals, the 4 x 400 meter relay, Seabury's girls were ahead by five points to win the team title. Punahou prevailed however, when their squad won the event (10 points), and Seabury placed fourth (4 points); resulting in a win by just one point for the Buffanblu as known as Punahou. I was fortunate to work with the hurdlers most specifically just once weekly, on the grass field on campus at Seabury, at Kamehameha School's track, and at War Memorial Stadium's track over the season. I have known one of those hurdlers since she was in elementary school. Christy Fell was in third grade at St. Joseph School the year I started there as a Kindergarten teacher in 2005. To be able to work with her in a sport that I competed in during high school at Santa Fe High in Santa Fe New Mexico was such an amazing experience. Seeing Christy make it into both the 100 and 300 hurdle finals was epic, and she was able to contribute to the team score with the four other point makers. I learned a lot about team management and coaching techniques from head Coach Bobby Grossman, and feel so lucky to be a part of what has been building over the years with the running programs. Working with Matt the assistant coach, continues to be dynamic. I follow Matt's good example, and work hard to keep updated with the sport of track, and field so I can coach any athlete I come into contact with, with helpful information. 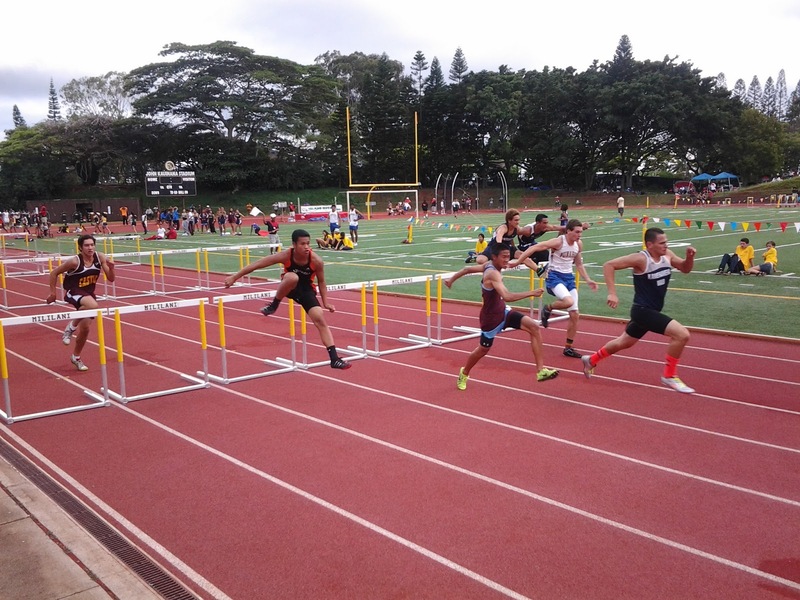 The best part of the State Meet was learning about the special community of track and field athletes on Maui, and that when it all comes down to it all of us coaches, parents, and fans want Maui to represent well. We all want to be a part of the success of the young people on this island, and help them to achieve their best in everything that they do. 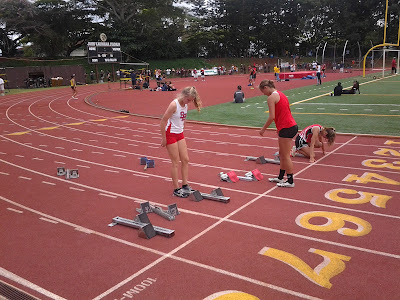 Over on our running site www.mauirunner.com I did an overall results post: 2013 State Track and Field, and Matt wrote a biographical piece: Spartan Girls Track, in addition to an in-depth look at the girls team since his involvement starting three seasons ago. I'm looking forward to meeting the new athletic director at Seabury, and being a part of both cross country, and track and field next year.